Kids, they grow up so fast, don't they? 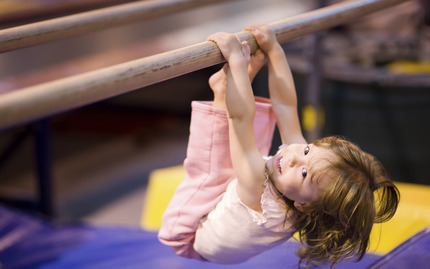 This Introductory Gymnastics program grows and changes with your child. In a safe, nurturing, and challenging environment, your child will leap from logs to avoid falling into water, search for treasure in a pirate ship, and use their imagination to discover a world of adventure and athletics. With the help of caring, charismatic instructors who'll be teaching your child, your kid will gain the strength, flexibility, confidence, and independence to love exercise, and embrace its inclusion as a component of his or her healthy lifestyle. Plus, who wouldn't want to spend a day searching for hidden treasure? Note: There is a $20 non-refundable registration fee already included in class price. It is the responsibility of the student/parent to schedule make-up classes. No monetary reimbursements are applicable for classes not made up.